My father was the best father in the world. Isn’t that what every daughter thinks about her Daddy? Well, I’m not sure whether they really do or not, but for me, my father was the best father ever. He was the strongest, kindest, loyalest, bravest man who ever existed. 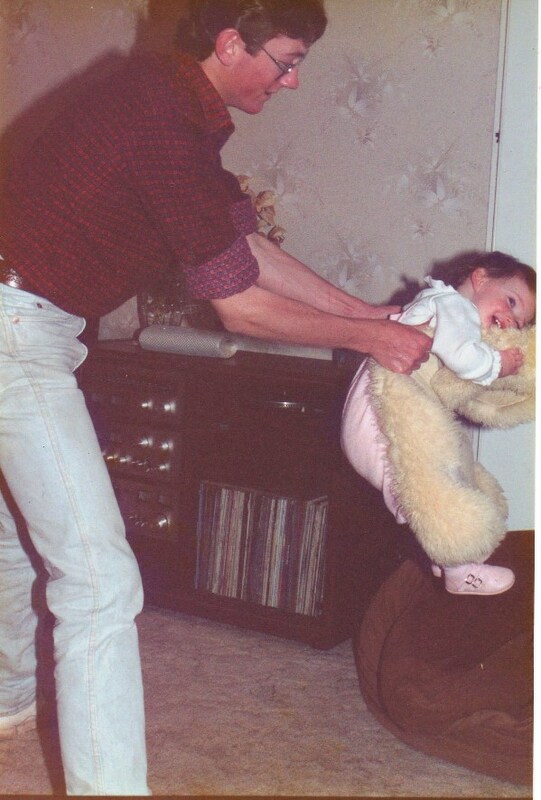 When Dad was with me, I was completely safe from all harm. Nothing could hurt me when Dad was there to protect me. When we were together I was indestructible and so was he. Why didn’t I ever tell him that? He needed to know that nothing could ever harm him, that he could fight dragons with his bare hands and still survive. Maybe if I had remembered to tell him that, he would still be here today…. Samuel Rubery Mottershead, born Manchester, Lancashire, England. March 29, 1920 ~ August 16, 1998. 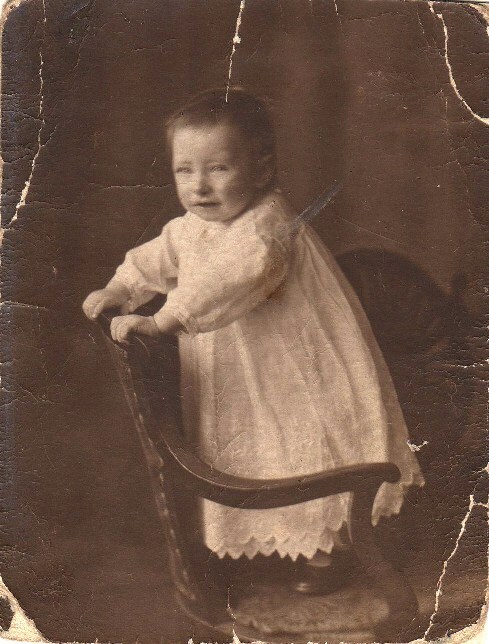 Baby Sam at 13 months of age. Samuel Rubery Mottershead (Sam) was the eldest son born to Samuel Mottershead and Florence Edith Thompson. As a youngster, he was the wild child, the one who ran away with his mates on an adventure, forgetting to mention to his mother where she could find him. The day Sam was born, he was blessed by fearlessness, a quality which remained with him throughout his entire lifetime. Nothing worried him; he never panicked; he never cried. He remained calm, logical and composed in all situations. That was the Sam the outside world knew. But there was another side of Sam that his close family knew. The compassionate, gentle man who loved cats and would do anything to protect an animal from harm. And the intellectual man, spending hours researching topics of interest, or helping his daughters with their homework. Sam in kindergarten. 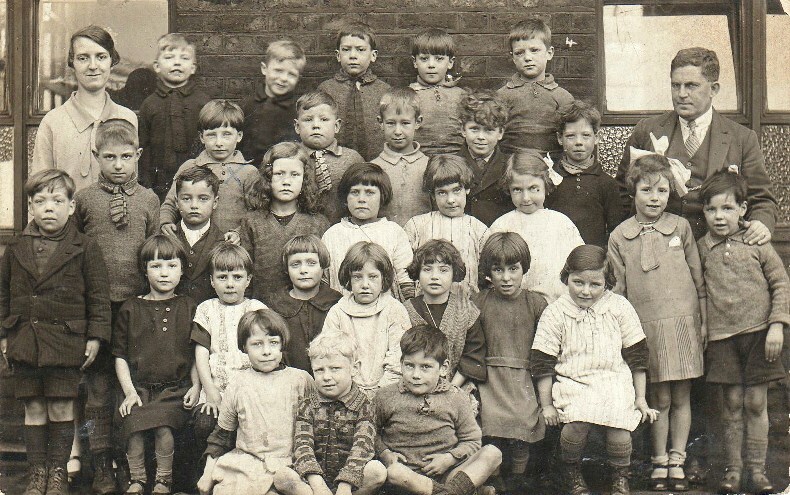 He is in the second row from the back, fifth boy from the right. He enjoyed his school days, as school satisfied his thirst for knowledge. A highly intelligent and inquisitive man, his mind retained knowledge and detailed facts with a precision that others only dreamed about. At only fifteen years of age, Sam met the girl he would spend the rest of his life with, Annie Mansfield. 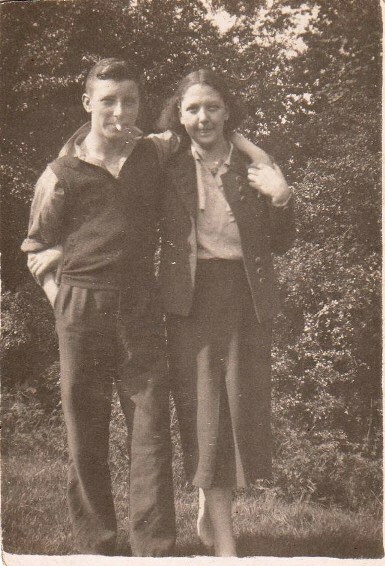 From the time they met they were together, and married four years later on October 27, 1939, in Stockport, Cheshire, England, just eight weeks after Britain and France declared war on Germany. Sam had initially wanted to join the navy, although his final choice was the army, in which he became a paratrooper. He was proud of the fact that he had flown in hundreds of aeroplanes, yet had never once landed in a plane! The years of World War II were not easy for Sam. His compassionate side could not tolerate the cold-blooded taking of human life that he witnessed and on a few occasions he was known to go AWOL (absent without official leave). Ultimately, he suffered from a condition known as “war neurosis”, and shortly after a six month stay in hospital, Sam was discharged from the army in 1945. 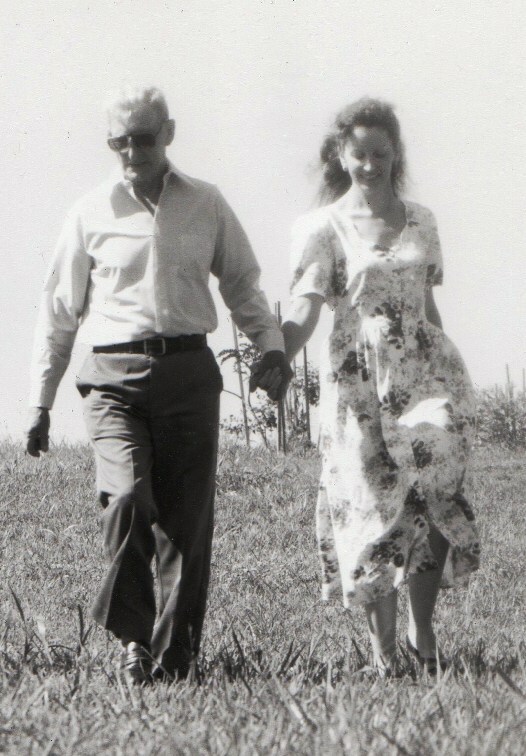 Between 1942 and 1946, Sam became the proud father of three girls and in 1951, the family of five emigrated from Cheshire in England, making their new home in Sydney, Australia. Living in a migrant hostel when they first arrived in their new country may not have been an ideal situation, but it was a beginning. 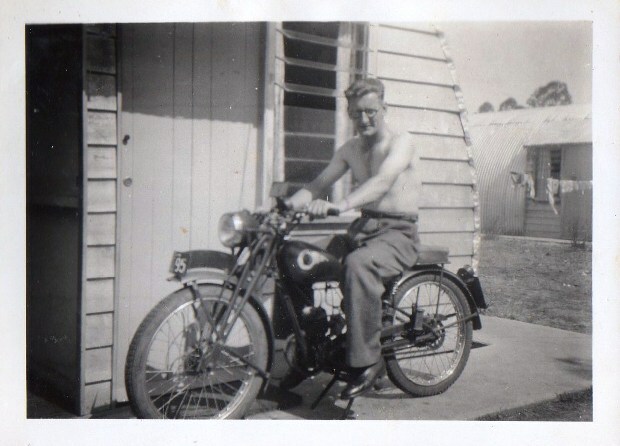 Before too long, the family had a home of their own, a motorbike for transport which was soon upgraded to a car, new furniture, the girls began their new schools and Sam was employed, working in his chosen trade as an engineer welder. 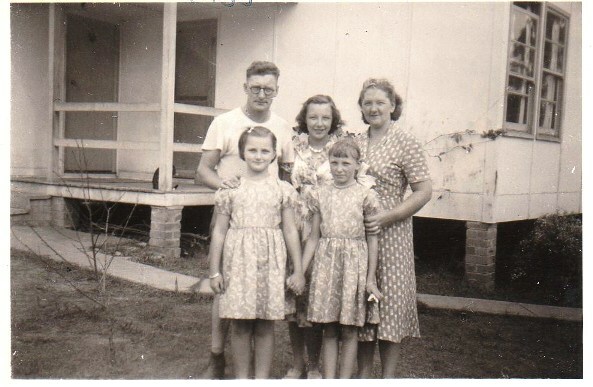 The family, now living in Australia, taken in 1955. 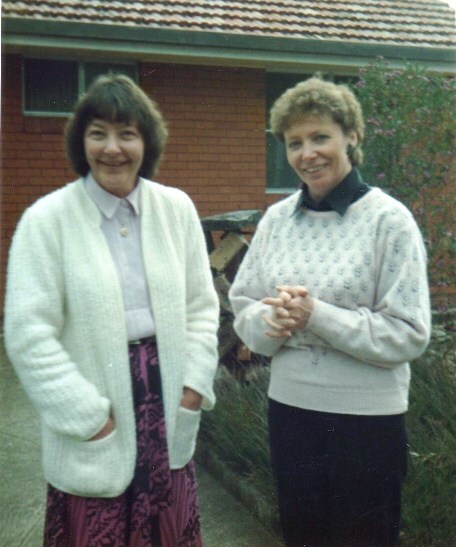 By the 1960’s, Sam and his family, (now four daughters, as I had been born), moved to the Blue Mountains, to live in a family home partially built by Sam himself. Sam could turn his hand to anything he set his mind to; building, structural gardening, painting, car repairs or welding. He was a man who could fix or make anything! Sam & Annie at the wedding of their daughter, Anne. 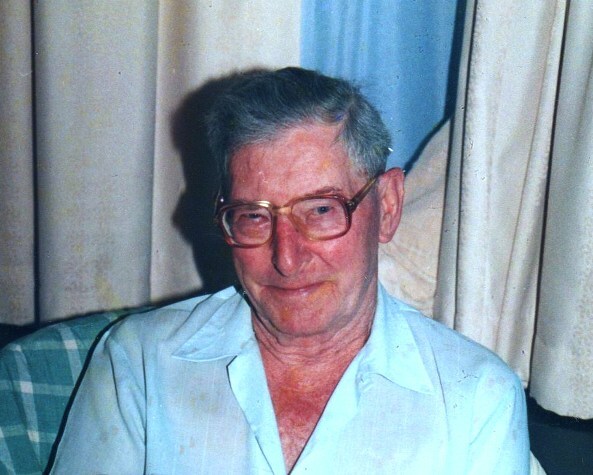 Throughout the decade of the ‘60’s, Sam continued to work as an engineer welder and by the late 1960’s he had accepted a position building pumps and working in the mines, just outside of Sydney. He saw his three eldest daughters all married and settled into lives of their own. Sam was ready for a change. A work mate had decided to move his family up to the northern N.S.W. area, to become self-employed in a general store and takeaway food business. This idea appealed to Sam and so the family, now with just one daughter, was on the move again. Whilst living in a caravan at Ballina, in northern New South Wales. Sam fell in love with an old general store, opposite a busy railway station and on the main Pacific Highway, in Murwillumbah, N.S.W. The old building appealed to his sense of history, and the projected income appealed to his pocket! An account of their move north can be read by clicking here…. hours or the old building they now called home. Sam’s instincts regarding the business being something of a “gold mine” proved to be accurate and after three years they were on the move again, this time just a few kilometres further north, to Tweed Heads, on the border of New South Wales and Queensland. This new situation was more suited to Annie, as they now had a home separate from their new business, a petrol station. Their home was now in Coolangatta, just over the state border in Queensland. After another three years had passed, Sam had had enough of being self-employed and went back to working in his old trade. Just before retiring age, the factory in which Sam worked closed down. Not satisfied with sitting at home with his feet up, Sam soon found further employment working in the kitchen at a local club. 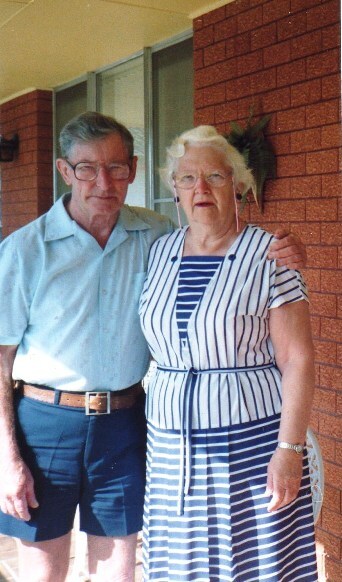 In 1993, it came as a huge blow to Sam when he lost his wife of fifty-three years, Annie. 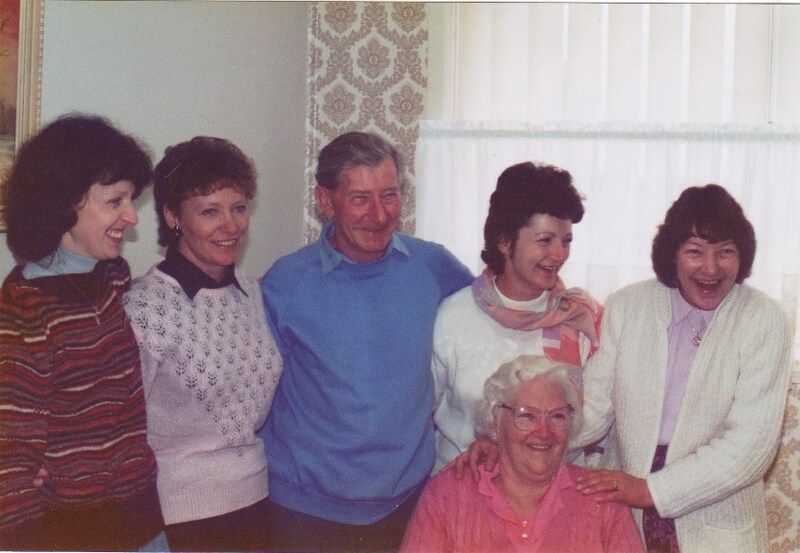 They had celebrated their Golden Wedding Anniversary in 1989, with a get together of their daughters, their daughter’s husbands, all the grandchildren and one great-grandchild. 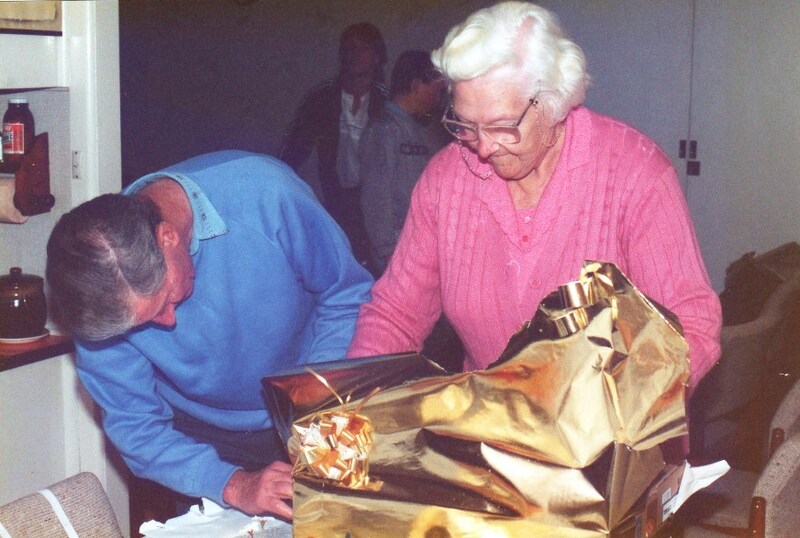 Photos of the celebration can be found here…A Golden Wedding Anniversary Celebration. Sam survived for five years on his own, staying active by teaching himself how to cook, joining Neighbourhood Watch, buying a bike for bike rides to the beach, going for long walks and regularly spending time with his family and friends. It was very sad to see Sam in his final year or two, as the once brilliant mind gave way to slight dementia, just as many bright minds are prone to doing. He remained living in his own home at Tweed Heads, being totally self-reliant, right up until his final day, when he joined Annie. Sam aged 17, with Annie, 16. 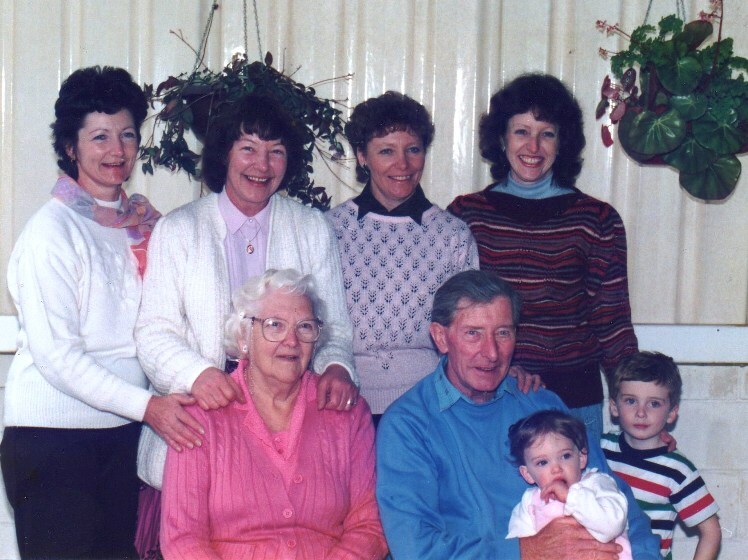 On October 27, 1989, the family of Samuel Rubery Mottershead and Annie Mansfield joined with them to celebrate their 50th Wedding Anniversary, at the home of their daughter, Vivien Knox at Valley Heights, NSW, Australia. 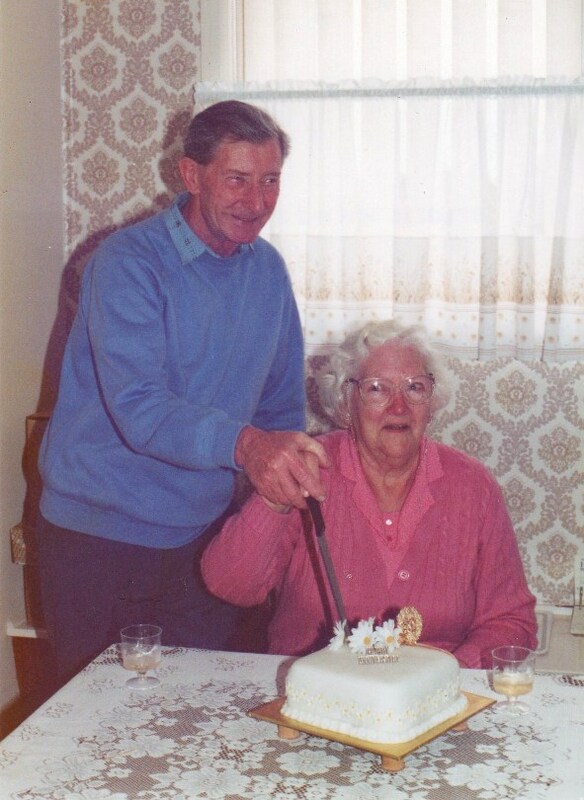 Their marriage took place on October 27, 1939, in Stockport, Cheshire, England. Sam, Annie, their daughters and two youngest grandchildren, Ben & Hayley Keevers. Sam, Annie and their four daughters. I wonder what was so funny? Daughters Annette Joiner and Christine Bell. Sam & Annies Grandaughter Jenine Bryce holding her son Mathew Bryce and Jenine's mother Annette Joiner, holding Sam & Annies youngest grandaughter, Hayley Keevers. 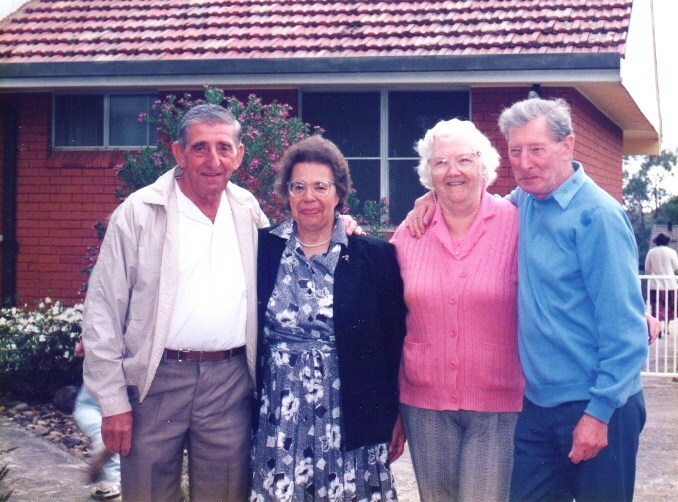 Sam's brother Bill Mottershead, his wife Fay, Annie and Sam. 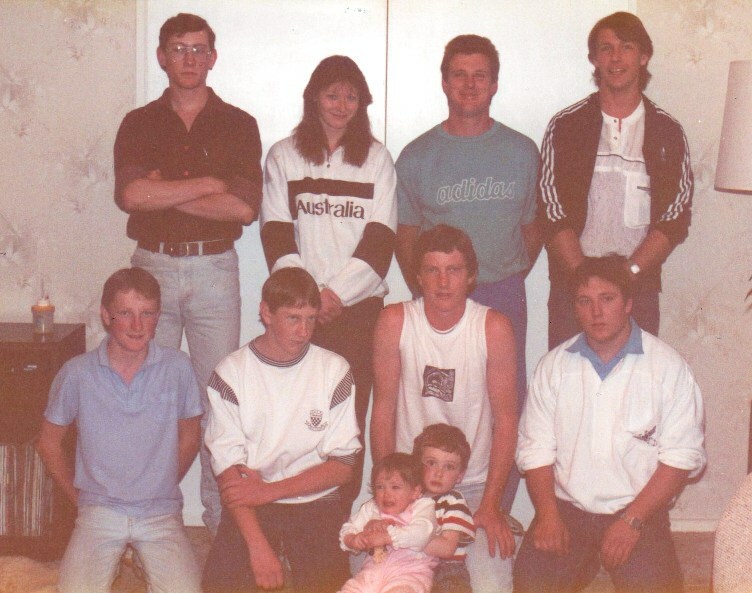 All of Sam & Annies grandchildren in 1989 ~ Troy Bell, Jenine Bryce, Andrew Knox, Jeffrey Bryce, Mark Bell, Scott Bell, Steven Bell, Mathew Knox, Hayley Keevers & Ben Keevers. Sam & Annie cutting the cake. Annie said she was so happy! 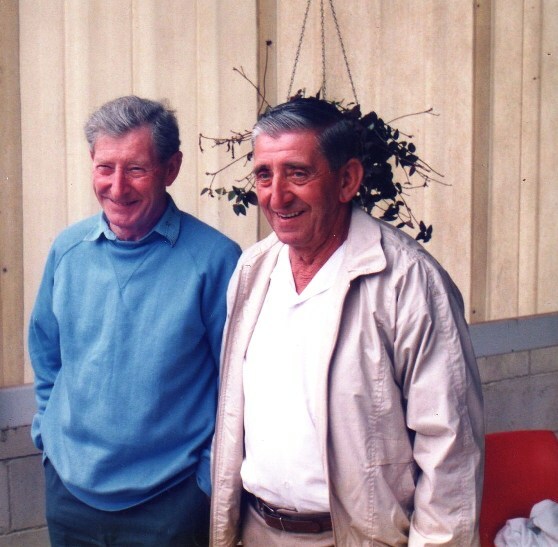 Brothers Sam & Bill Mottershead. 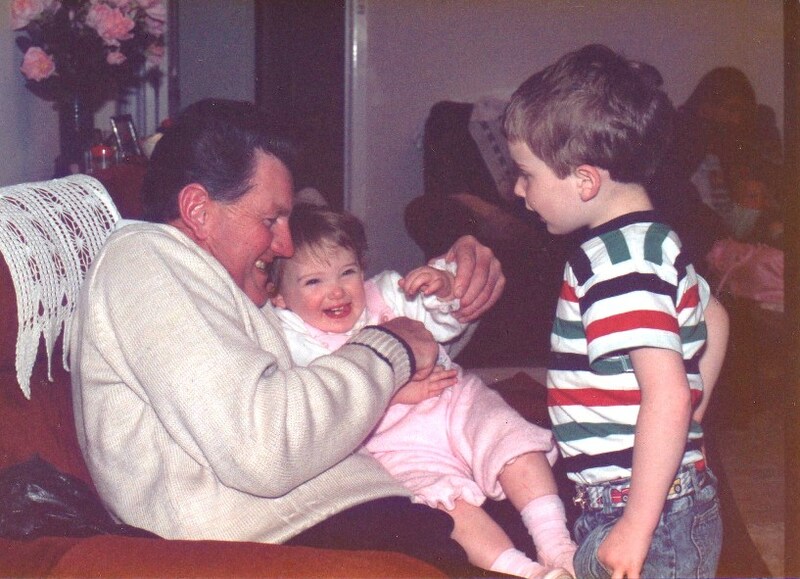 David Bell tickling his neice, Hayley Keevers, while big brother Ben looks on. 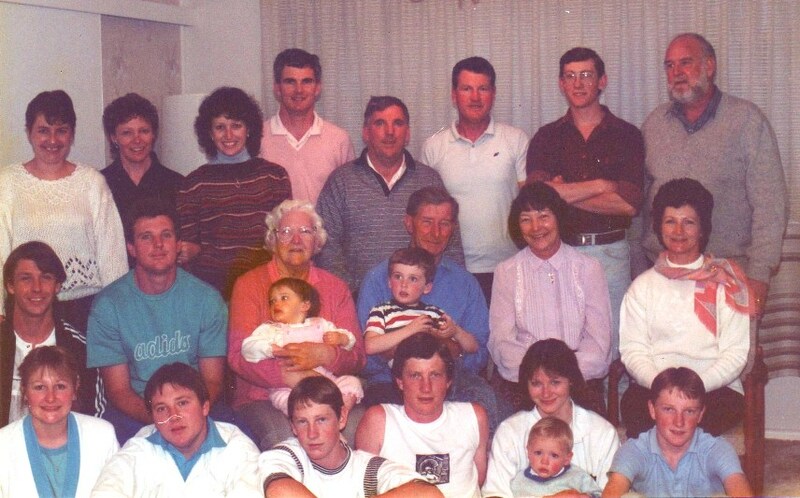 The whole family ~ Maria Bryce, Christine Bell, Joanne Keevers, Allan Keevers, Adrian Knox, David Bell, Troy Bell, Brett Joiner, Jeffrey Bryce, Andrew Knox, Annie holding grandaughter Hayley Keevers, Sam holding grandson Ben Keevers, Annette Joiner, Vivien Knox, Jenni Knox, Mathew Knox, Scott Bell, Steven Bell, Jenine Bryce holding Mathew Bryce and Mark Bell. 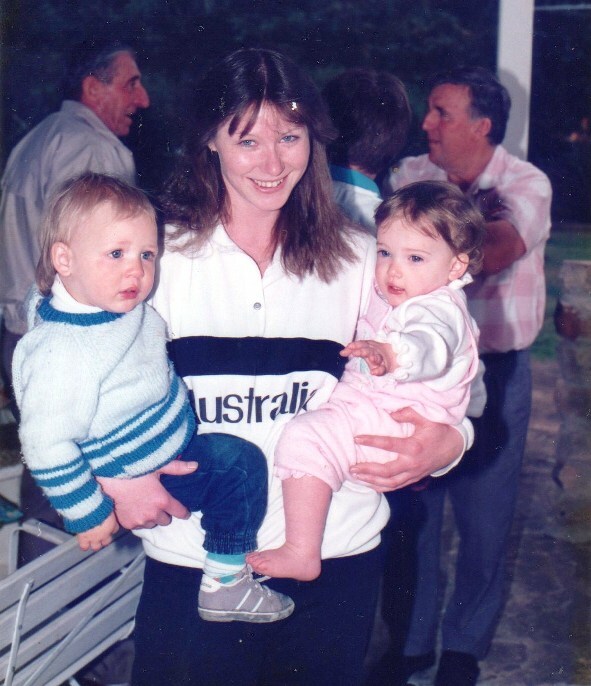 Grandaughter Jenine Bryce holding her son, Mathew Bryce and her neice, Hayley Keevers. The two babies were often refered to as the twins, as they were born one day apart, yet Hayley is the generation above Mathew. Sam and Annie...So many presents to open! 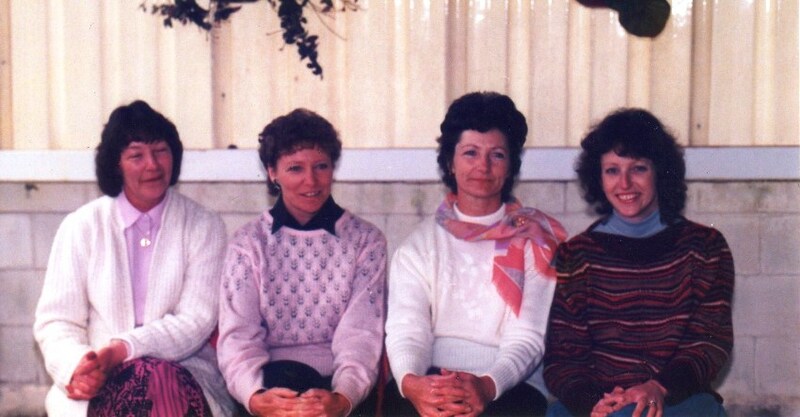 Sam & Annies four daughters ~ Annette Joiner, Christine Bell, Vivien Knox and Joanne Keevers. 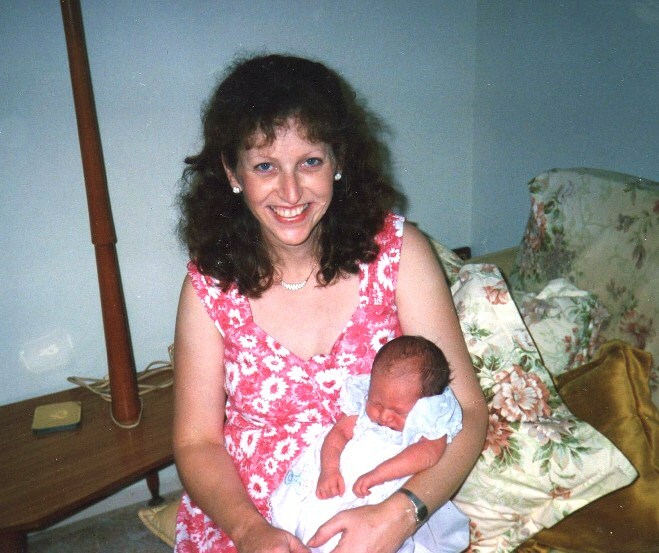 Annie with her eldest grandchild, Jeffrey Bryce. Cousins Troy Bell and Hayley Keevers at play. Chatting with the girls outside in the Bar-b-que area. 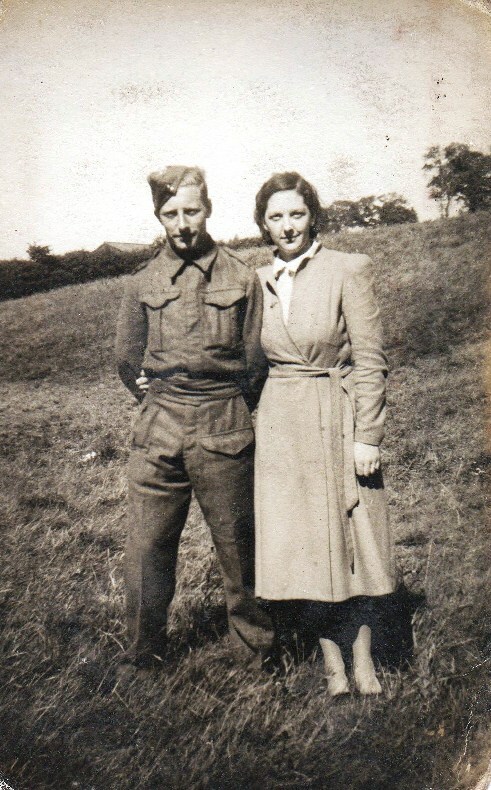 Sam and Annie were married just after the outbreak of World War II, and a Sam was joining the army, they didn’t spend very much time preparing for their wedding day and there were no photos taken. 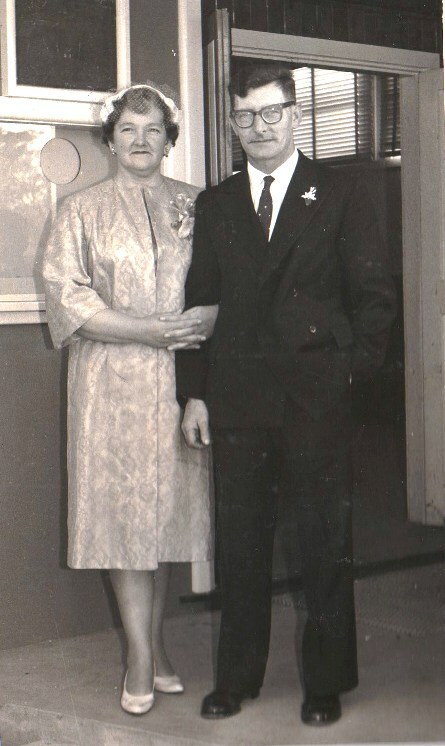 They were married at the registry office in Stockport, with Sam’s parents as their witnesses. 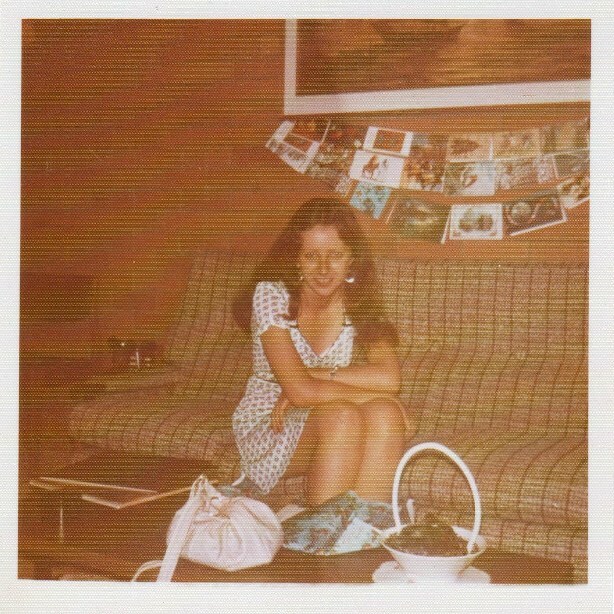 This photo is Annie, wearing the dress she was married in. 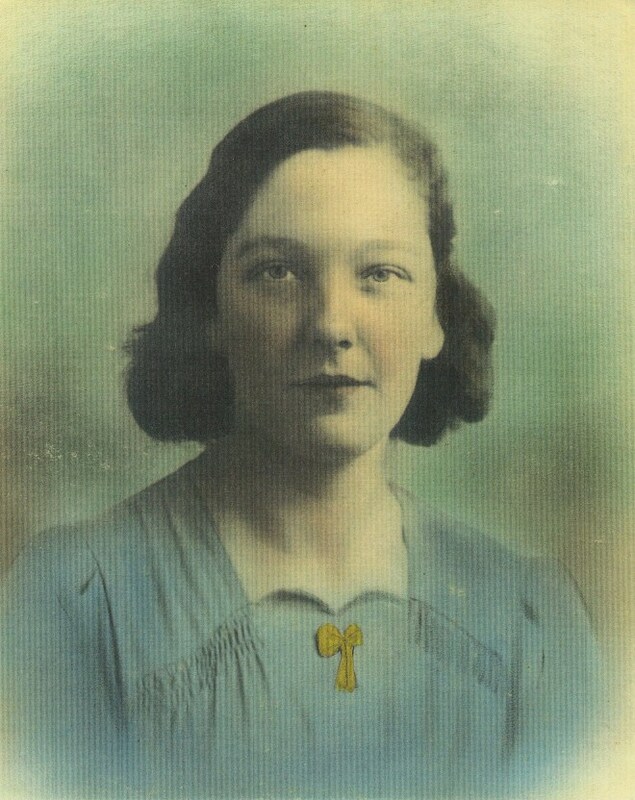 Annie said an artist added colour and definition to the original photo taken, and the gold coloured bow on her dress was a brooch. 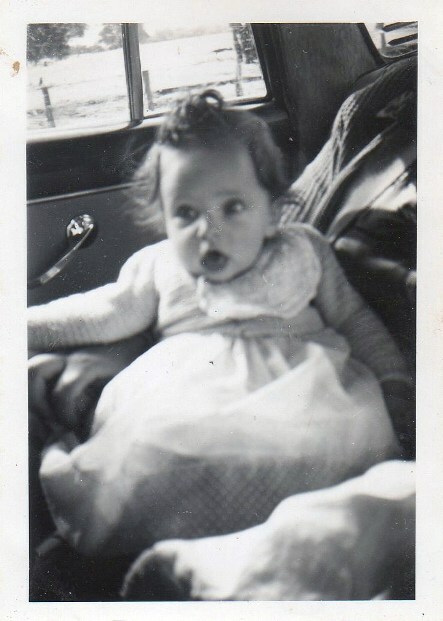 During the latter years of the Baby Boomers, I was born into a family of English immigrants at Penrith, New South Wales, Australia. My three elder sisters were all verging on adulthood when I was born and by the time I had reached the age of my earliest memories, they all had boyfriends and were preparing for marriage. The three men my sisters married are as much a part of my childhood family as my sisters, I can’t remember a time when they weren’t in my life. And so it came to pass that I spent my childhood years as the only child, surrounded by a family of eight adults. I really did enjoy an idyllic existence. 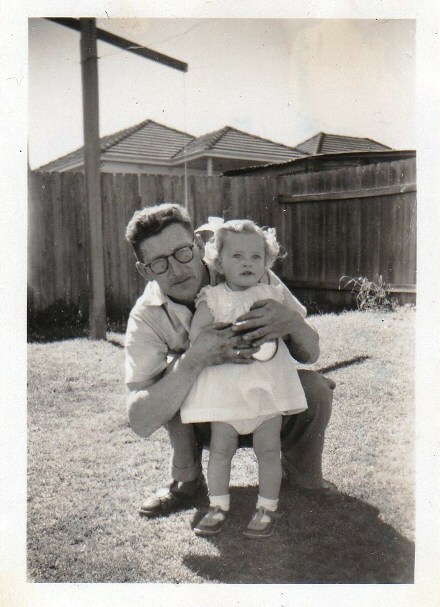 At 18 months old, with Dad. 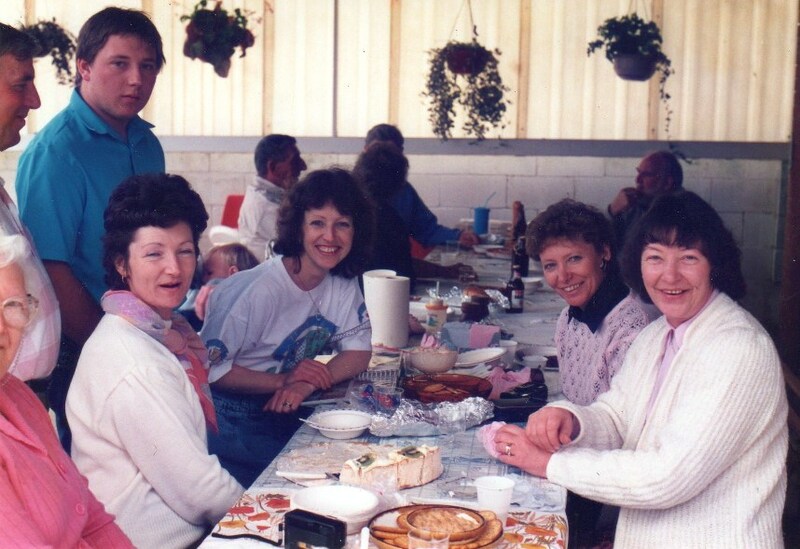 With my three sisters all married and with families of their own to care about, Dad and Mum decided the three of us would move to a warmer climate, so our house was sold, along with all of our furniture, and we headed north in search of a warmer climate. For Mum and Dad to uproot the three of us and move north must have been the simplest of ideas – they barely batted an eyelid and off we went. I can imagine after transporting themselves and their three young daughters by ship to the other side of the world, a move north, taking them a mere six-hundred-and-fifty miles would be easy. An account of the move north, where we finally settled at Murwillumbah, N.S.W. can be found here…. For me though, it wasn’t easy. I struggled to come to terms with leaving my sisters, brothers and their children, only accepting the idea of moving because I had to go, I had no other choice. It helped to know we would make regular trips back to the Blue Mountains. At age nineteen I met the man who became my husband and the father of our four children. Allan was born and raised in Murwillumbah, N.S.W. but had accepted a position in Sydney after leaving school, with Telecom Australia, so I moved to Sydney to be with him. We were married at St. Philip Neri Church in Northbridge, Sydney, in 1979 and have two sons and two daughters. Allan and I with our first-born, Ben. I have researched my husband’s family history over the years but will not record any of his family history here. Allan has a very large extended family and all lines of his family have been thoroughly researched, however, if anyone has an interest in the following surnames, I would be more than happy to share any information I have or put you in contact with someone who can help ~ Keevers, Kelly, Twohill, Mills, Hatton and Neylan. We spent the first fifteen years of our marriage in Sydney, the city I still call home. In 1992 however, and seven months pregnant with my third child, I made the same move I had made many years earlier with my parents – we moved back north. There was a purpose for the move, however traumatic it seemed at the time. 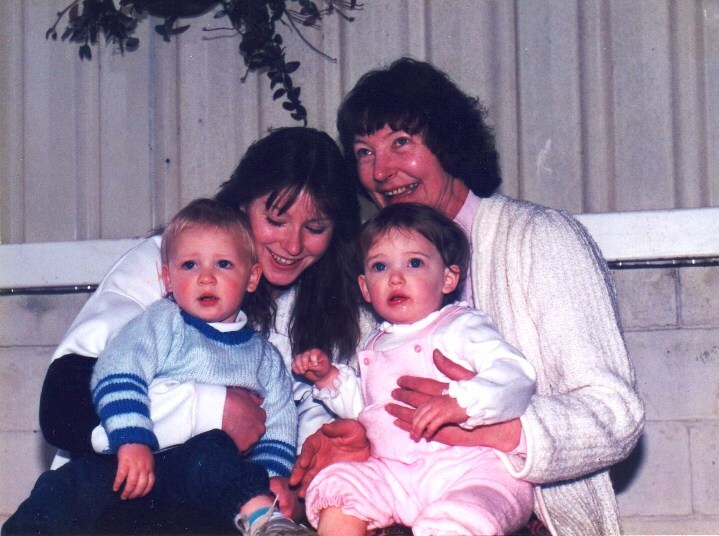 My mother had taken seriously ill and I didn’t know how much longer I would have her. By August 1993 my mother was gone and over the next five years, it gave me the opportunity to really get to know my Dad. (Mum always told me that there was a silver lining to every cloud!) 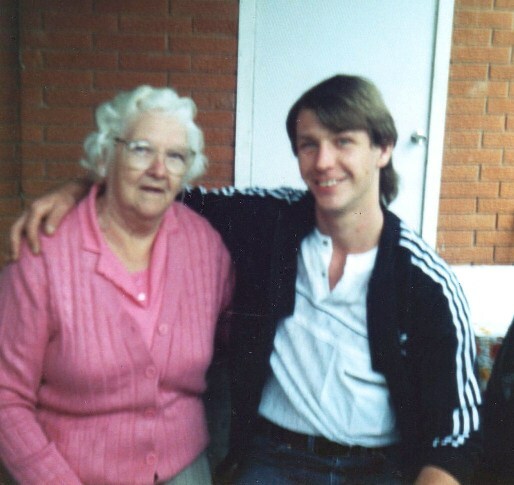 Dad and I became very close during the years he lived alone and it hit me incredibly hard when one day, without a word of warning, he had joined my mother. ‘Dead’ is such a permanent word so I will not refer to any of my family in that way. They are no longer with me in physical form, but they are still with me. 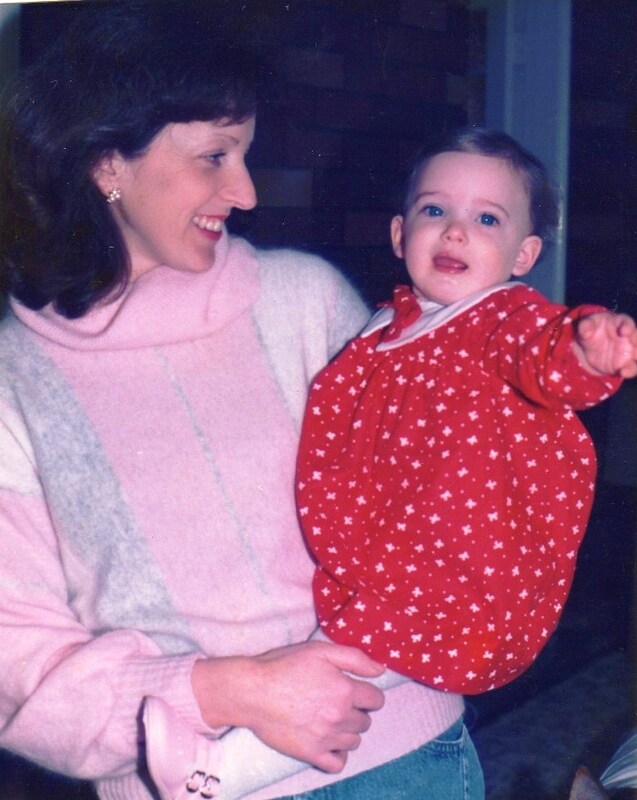 Holding my first daughter, Hayley. Starting this website has been a dream of mine for many years now. It has taken a while to get my head around the planning and layout of what I wish to achieve and I sincerely hope that many people will have the opportunity to be enlightened on aspects of their own branch of the family by visiting this website. My one week old baby girl, Emma. As new relatives are added to the site and I build on the information I have already found, it is my hope that you will find here more than just the branches of a tree, with names, dates and places. 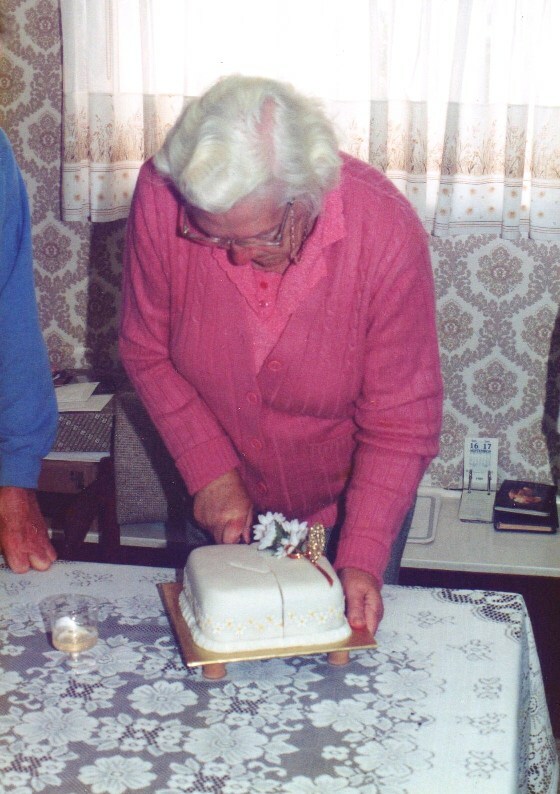 For as many relatives as possible, I will also include photos, personal stories and information on their lives. This is where I will be asking my extended family to assist, by sending photos and stories of their own for inclusion here. Baby number four – Adam.